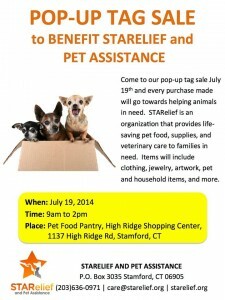 July has begun with a flurry of activities and opportunities for us at STARelief! So here’s a quick peak into our calendar for the month. We began the month with Web Thrift Store’s Thrift Snap contest. After this we had the wonderful opportunity of winning a $500 donation from DGP for pets through votes on Facebook. 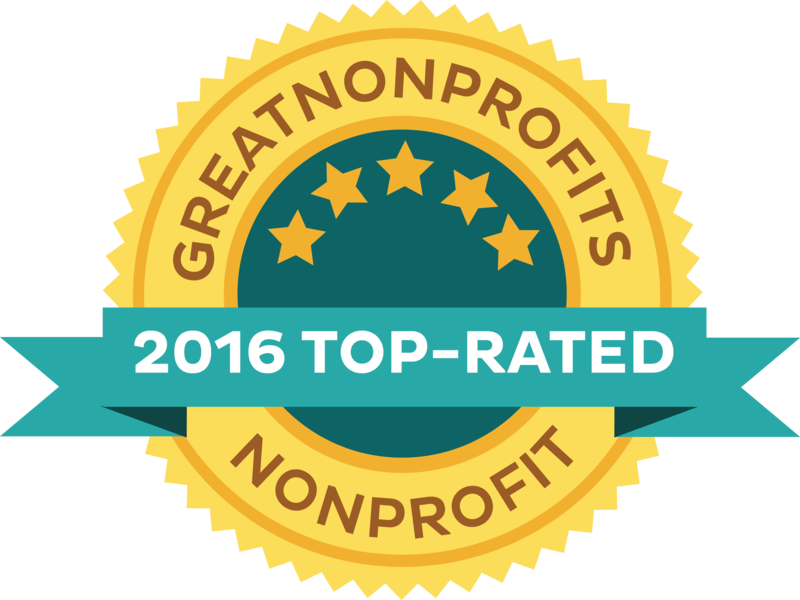 We had our supporters vote for us on the DGP For Pets page and we’d like to take this opportunity to thank them for their support! The month isn’t over yet though. 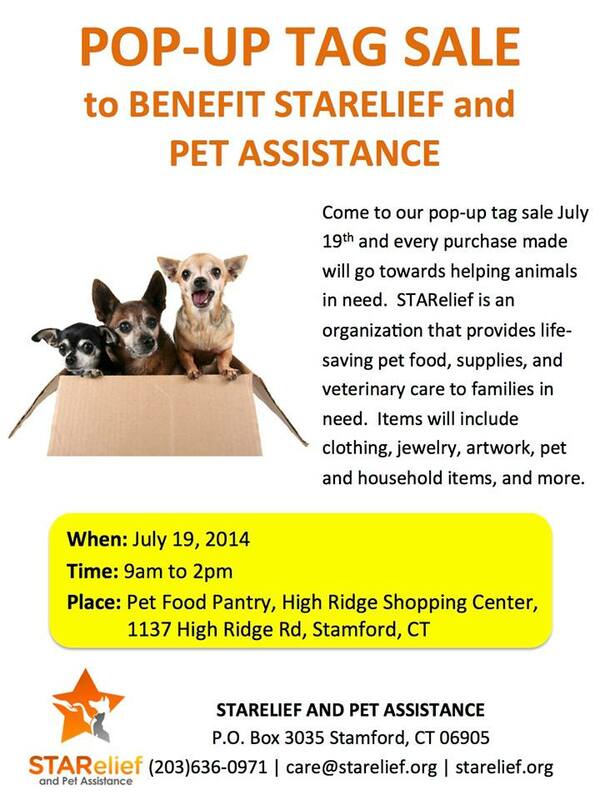 STARelief has organized a Pop-up tag sale on the 19th of July (yes it’s the coming Saturday!) from 9 am to 2 pm at our pet food pantry on High Ridge road (High Ridge Shopping center, 1137 High Ridge road, Stamford, CT). The proceeds from each sale will go towards assisting pet families in need. So please join us and aid in making a difference to a loved pet and his family! We have yet another contest that we are participating in this month. It is the #ThriftyEstateDrive from Web Thrift Store. Donate anything over the value of $50 (original price paid for the item needs to exceed $50) by listing it on our store at www.starelief.webthriftstore.com and help us win 100% of the proceeds from their sale! We are right now at the 7th place, but with your help we can place much higher! So clear out your cupboards and donate those unused earrings, bags, jackets or shoes. Who knows, cleaning your closet may help keep a pet Happy, Healthy and Home! Help us win and make a difference in the lives of numerous pets and pet owners! For after all, it’s your support that keeps us going! It’s time to bring out the grill and prepare to have family and friends over this 4th of July weekend! Whether you plan to stay home and have guests over or are planning to take a trip over the long weekend, the anxiety over how your pet is going to handle this noisy celebration is sure to dampen spirits. Many pet owners confess that the 4th of July holiday is one of the most stressful times for themselves as well as their pets. Indeed the highest number of missing pets is reported the very next day. The reason for this is that dogs and cats (in fact most animals) are far more sensitive to noise than us humans. They can often hear more than 1.5 times our normal range of sounds! However, this holiday does not need to be as stressful if we are better prepared. Here are some tips to help you ease your pet’s anxiety this holiday! Make sure to let your pets out early in the day: Try to walk your dog or let out your cat earlier in the day. Ideally your pet needs to get his/ her fresh air and exercise before the streets get crowded and the fireworks begin. Even if you normally take him/ her out only in the evening, make an exception and get your pets to exercise early in the day. However, do not deny them their usual outing. This may cause your pet more stress. Make your home comfortable: before the fireworks begin, make sure to close the curtains and drapes around the house to cut out the excess noise. You can also create some white noise like running the washing machine or the vacuum cleaner. You can also play some soothing music to calm your pet. Give them company: When pets are anxious and stressed they automatically look to their humans for comfort. Try to stay around them and calm or soothe them with your presence. Ensure that you are not stressed yourself for the animal can sense you anxiety and will think that there is some cause for concern. Keep special treats handy: Keeping your pets favorite treats handy will help in diverting their attention from any commotion outside. You can also engage them in some activity and hand out these treats as a reward. Last and not least- Microchip your pet: Enough stress cannot be laid on the need to microchip your pet at a time when they can easily get lost. Microchipping your pet helps you track them even if they get lost. Animal control officers and Veterinarians often look for Microchips on pets that have strayed or are lost to identify the owner and ensure a safe return. You can learn more about how microchips are inserted and used here. 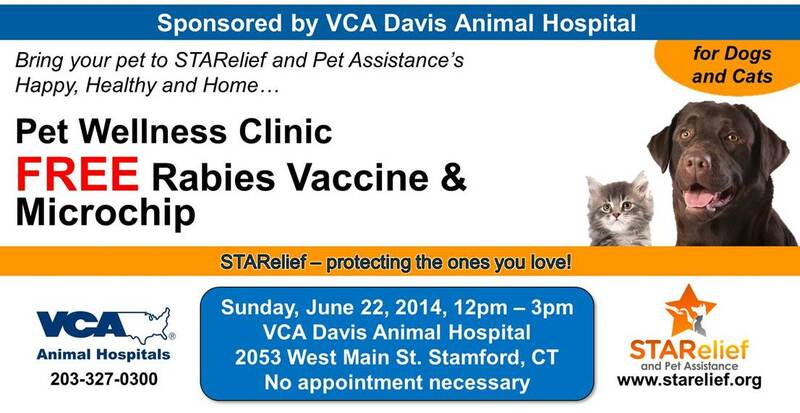 To help you cope with this holiday, we are holding a FREE Pet Wellness clinic this Sunday (22nd June) at the VCA Davis Animal hospital between 12 pm and 3 pm. 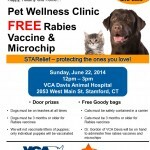 Bring your pet for a free Rabies vaccine and microchip. Be prepared and enjoy this long weekend! 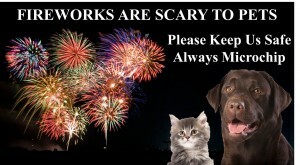 With 4th of July less than a month away, many pets and their owners tend to get hassled. 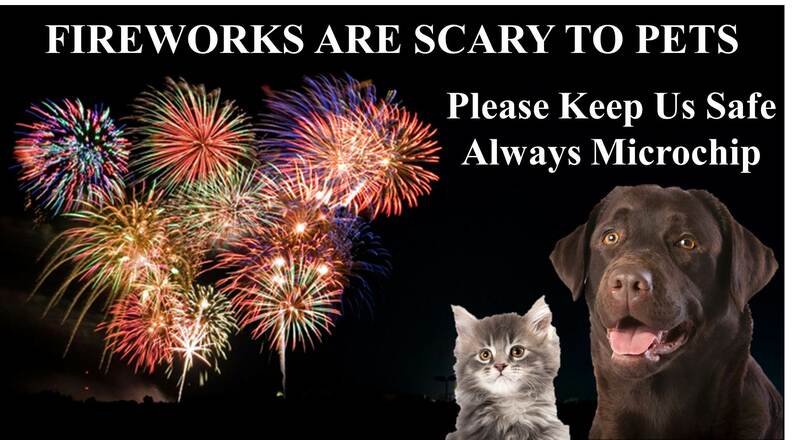 The inevitable fireworks leave most pets scared and their owners stressed! Many Veterinarians say that the 3rd of July is amongst the busiest days at their clinics with many families coming in to collect medication and complete checkups before the holiday. More pets are lost on Independence day than any other day of the year! This July 4th be better prepared to face (or shy away from) the fireworks. 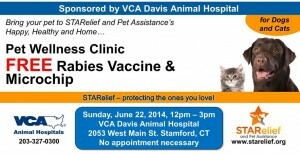 STARelief has partnered with VCA Davis Animal Hospital to provide a FREE Pet wellness clinic! 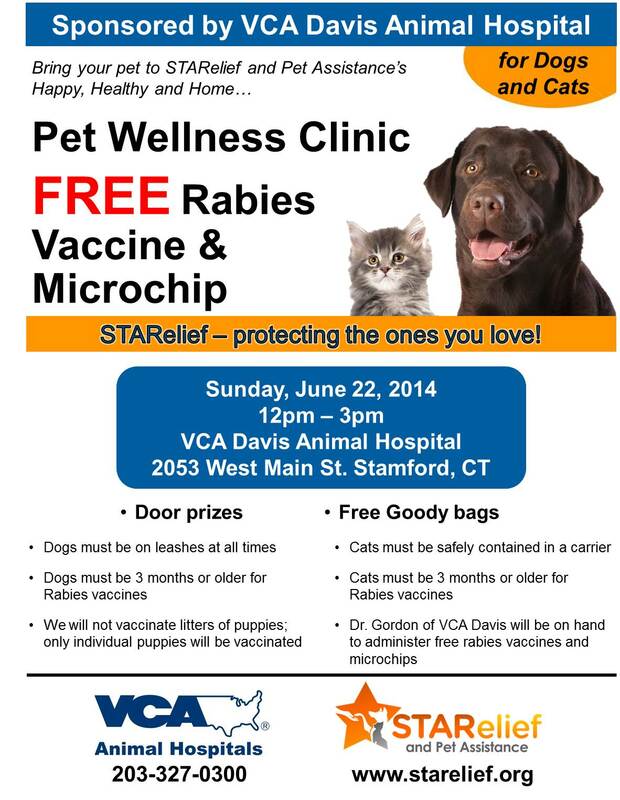 On the 22nd of June, bring your pet for a free Rabies Vaccine and Microchip between 12 pm and 3 pm to the VCA Davis Animal Hospital in Stamford. Do bring your pet and help spread the word. Keep watching this space for some more tips on how to keep your pets safe and comfortable during this holiday! Are we over-protective of our pets? I know of a friend who is a great animal lover. She often rescues abandoned pets and tries to provide loving homes for them. So great is her love for the critters that she views her own dog as a ‘child’ (at this point there are many of us who are probably silently nodding in approval- for after all we are all guilty of this to some extent!). Yet, when she hands over the rescued animal, she hands over a list of do’s and dont’s, constantly calls the to-be-owners with instructions and borders on intrusive behavior, successfully scaring away many a prospective loving owners! So here comes the all important question- Do we allow our love for animals to blur our reality? As one who works with rescuing abandoned animals, it becomes natural to view the world with cynicism. Yet, doesn’t it also become one’s responsibility to recognize good intentions and trust our fellow human beings? 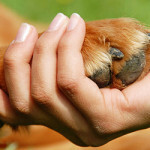 Have you had similar experiences with an over-protective owner or rescue worker? What are your views? Let us know in the comments section! Puppies from the pet store? No Thanks! How often have you gone to the pet store and stood staring at the beautiful little puppies and kittens on display? Sometimes you can pet them, hold them and cuddle. And boy do they love the attention. Ever wondered what that little puppy has undergone before it landed up at your local pet store? Here is the harsh reality. 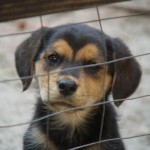 Almost all pet store puppies come from puppy mills. These puppies and their parents are subjected to extremely harsh and filthy living environments. A puppy mill is a for-profit organization which seeks to minimize overhead costs and focuses on generating revenue. This means that a puppy mill will focus on breeding dogs and selling them as quickly as possible, and until that sale is made, the dogs are made to live in appalling conditions. Since the focus is on minimizing costs, very often 3 – 4 small dogs are stuffed into a single cage with hardly any room to move around. They are fed poorly and often develop diseases due to poor hygiene. Many a time, these dogs develop behavioral problems due to the extreme conditions they are raised in. Most puppy mills have poor lighting, ventilation and sanitation. Very often these animals even lack access to veterinary care. To say that these puppy mills are cruel, would be putting it mildly. Here is a video by the Humane Society of the United States which throws some light on the pathetic conditions of these poor animals. Every year, retail pet stores sell more than 500,000 dogs, while 5 to 7 million dogs enter shelters. In many states, puppy mills are legal. Only 26 states in the U.S have laws to regulate commercial kennels to prevent cruelty to animals. It is hence our responsibility to look out for our canine friends. When you are looking for a pet, make a conscious choice. Check in your local shelter to see if you can find a pet suitable to your needs. If you choose to go to a breeder, ensure that the breeder has a good reputation. Do your research. 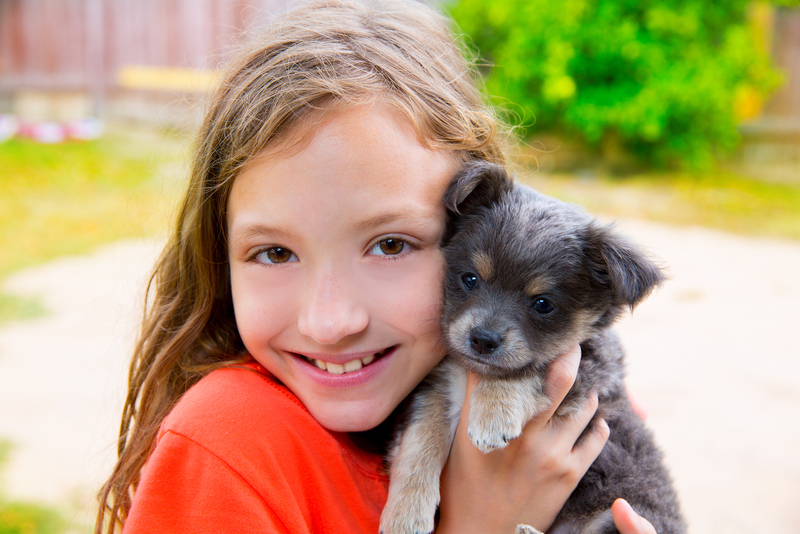 A good breeder will ensure that the animal has been treated well and is healthy and happy. The need for a good home for the pet ranks higher than profit for a breeder of repute. Avoid purchasing your pet at pet stores or online. Most pet stores deny sourcing their puppies from puppy mills and do not disclose the true history of the animal. Before making a decision to buy from a pet store, explore other reliable sources. Pets bring great joy into our world. It is our responsibility to ensure that cruelty towards these wonderful creatures is stopped. It’s that time of the year again! We get together and spread the Christmas cheer, with sparkling lights and lovely gifts for near and dear ones. Behind every gift, there is a thought- will the recipient like it? Can they use it? Is it something that they want desperately? If the perfect gift is a pet this Christmas, halt! And think! Before you rush to grant your loved one the pet they have always dreamt about answer a few simple questions. Is the future owner of this lovely animal ready to make a commitment spanning years? The average life span of a dog is 11 years and that of a cat is about 13 years! So before you rush into gifting a pet, pause and evaluate if your loved one is willing and capable of making a commitment running into years! Having a pet can be expensive. So before gifting a pet, do evaluate if the future owner will be able to afford caring for the animal. 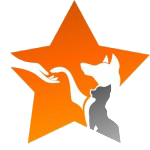 Right from pet food to veterinary care, having a pet can mean a significant monetary investment! Loving animals does not automatically mean that one is willing or capable of caring for a pet! So if the idea of gifting a pet stems from someone loving animals, it may not be ideal to gift them a pet! While pets make lovely surprises, do remember that gifting pets impulsively might result in a lot of unnecessary hassles for both the owner and the animal alike! Having said that, there is no denying that a pet can bring great joy to the family. So if you are planning on gifting a loved one a pet, do your research ahead of time! A lot is being said today about the benefits of growing up with pets in the house. The benefits that people list range from young children developing better resistance to allergies to better behavior training. Yet, when I look back at my growing up years, I remember the two dogs (one succeeding the other) that tottered behind me and unknowingly taught me a whole lot of things that would later change the way I look at our world. The first dog we had at home was a golden Labrador. She was the most beautiful dog I have ever seen. She stood tall and slender, her eyes betraying the softness of her heart. She was brought home when I still very young, so her size alarmed me and my friends. When I overcame my initial fright I learnt that Ruby (which is what we named her) had many lessons to teach us. When I look back now, I am appalled at how we played with Ruby. We tugged at her tail, climbed over her like a horse, hugged her tight and pretended she was our dog detective on mysterious journeys into different lands and what not! Yet, through all those years Ruby never once so much as scratched any of us. She never barked in protest and always followed us into every nook and cranny! One of the greatest lessons I learnt from my beloved dog was the virtue of patience. She somehow understood that we were children and was always patient with us, through whatever we did. When Ruby was a grand old lady, her master (my grandfather) passed away. For 3 days she refused to eat a single meal. We coaxed her, brought her favorite foods, tried to feed her by hand and tried every other trick in the book. But Ruby never touched a morsel, she mourned for her beloved master, for it was he who used to feed her every day. Soon afterwards, she lost the will to live. She fought terrible disease and finally passed on to join her master. There is no love in the world that is purer than the love and faithfulness of an animal to her master. After Ruby, we brought home another Labrador – a chocolate colored fellow, whom we named Brandy. When Brandy came home he was forty days old. He had blue eyes and fit into my palm. It was love at first sight. Brandy missed his mom terribly and would choose to cuddle up to me or my mother as he slept (he conveniently ignored the men of the house!). As he grew up, we taught him to climb stairs, sit, roll, play, all like he was a human baby. The hours of joy that Brandy brought the household as he grew up remain unaccounted, but the memories of our little boy can never be erased. He is now an old man, but still behaves like a child when he sees us! And the way he looks at me when I walk in through the door, still fills my heart with immeasurable joy that only he can bring! 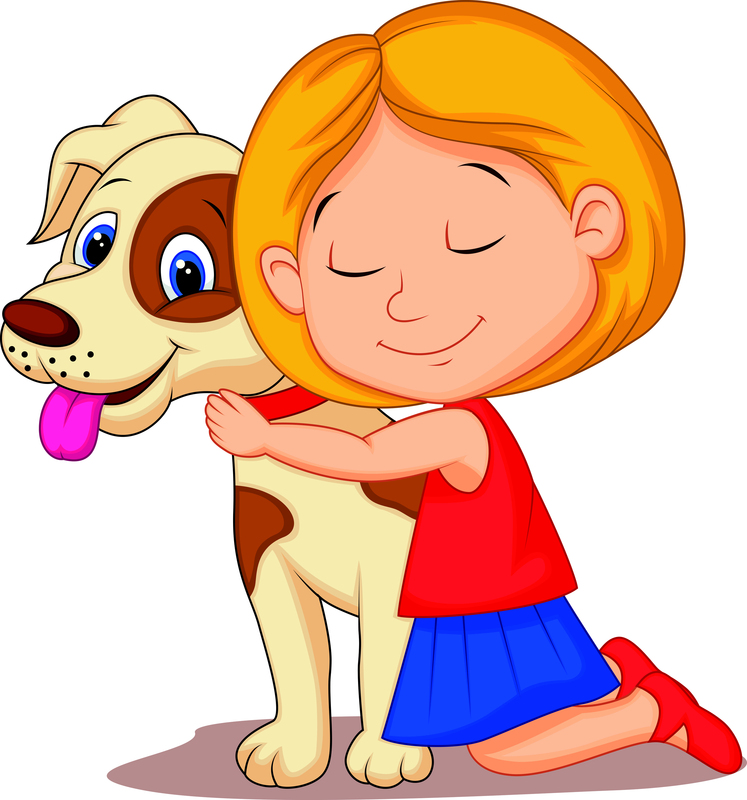 There may be a hundred researches that suggest the medical benefits of children growing up with pets. I have just a few, but these to me are the most valuable! 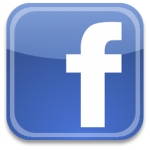 Do you have incidents from your childhood or those of your children’s that you would like to share? Share them with us in the comments section! This is exactly how STARelief began, almost two years ago! We were a group of volunteers who had worked with various Animal Rescue centers and saw animals brought to the shelters because their families could no longer afford to care for them. It was this painful separation of pets from their families that lead a group of us to join hands and build STAReleif and Pet Assistance. We began in a very small way with a handful of volunteers and patrons, and have today assisted over 300 pets stay Happy, Healthy and Home. Now more than ever we are committed to fulfilling our vision- to ensure that no pet guardian will have to give up their pet due to financial hardships. Today, two years down the line, we have a lot to be thankful for and are proud to launch our new website! We promise to strive towards making our vision a reality and also hope to take you along on this exciting journey! So watch this space for updates, information, opinions and for lots more! Here’s wishing you all a very Happy Thanksgiving! And a special thank you to all those who have helped STARelief go from strength to strength!